Join our tour host, Chef Scott Webster, as we discover the sights, sounds and tastes of this fascinating country from the decks of the Viking Rurik. Unpack once and relax onboard your floating hotel and discover jaw dropping treasures and stunning rural landscapes. Envision Peter the Great luxuriating in massive Peterhof Palace, then see how multiple families shared living space at a Soviet-era kommunalka. Soak up the steam in a traditional banya in riverside Mandrogy village. Share stories at the kitchen table of an Uglich family. Savour Russian caviar with your blini pancakes. See the swirling onion domes and stout towers of Moscow’s Red Square. From St Petersburg to Moscow, this 13 day voyage reveals the real Russia as never before. Come with us and share in Scott’s love of food and wine on this amazing journey. Arrive in St. Petersburg, “The City of 300 Bridges,” then transfer to your ship. After boarding, you have free time to relax before dinner. This morning, proceed to the Winter Palace to visit the legendary Hermitage Museum, where you can marvel at the vast collection of art, antiquities, jewelry and sculptures. Return on board for an early dinner, followed by an evening performance of traditional Russian ballet. Today’s excursion goes to the Pushkin area where you visit Catherine Palace, the elegant rococo 18th-century summer residence of the Russian tsars named for Catherine I (widow of Peter the Great). Tour its various halls, including the storied Amber and Agate Rooms, and see the ornate decor throughout. After lunch, embark on a city tour including St. Isaac’s Cathedral, Peter & Paul Fortress and Nevsky Prospekt. Dine on board and enjoy an optional Russian folkloric performance this evening. Most of the day is free to see the sights that interest you. Visit one of the many palaces, churches or museums, or take an optional morning tour to Peterhof Palace, admiring its landscaped gardens and beautiful fountains. In the afternoon, you may choose to join an optional kommunalka visit to get a glimpse of these communal living spaces or take an optional tour of St. Petersburg from the water. Lunch and dinner are served on board as we depart early this evening. During breakfast, dock at Kizhi Island, located on Lake Onega, Europe’s second largest lake. Set out on a walking tour through the Open Air Museum of Architecture, a UNESCO World Heritage Site. Here, see a collection of wooden houses, windmills and churches representing ancient Russian architecture, highlighted by the famous 3-tiered Preobranzhenskaya (Transfiguration) Church, a fairy-tale-like structure built in 1714 without a single nail. Depart Kizhi in the late morning and enjoy the scenery as you continue cruising through the rest of the day. During breakfast, dock at Kizhi Island, located on Lake Onega, Europe’s second largest lake. Set out on a walking tour through the Open Air Museum of Architecture, a UNESCO World Heritage Site. Here, see a collection of wooden. 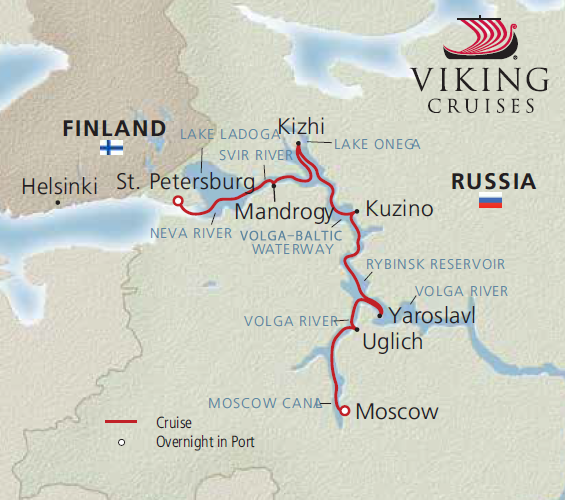 We continue cruising along the Volga–Baltic Waterway. This system of rivers and canals, spanning 229 miles and seven locks, links the Volga River with the Baltic Sea. Arrive in Kuzino, a typical Russian village. Take a guided walk through the historic Kirillo-Belozersky Monastery, founded by Saint Cyril in 1397. See several small wooden chapels, the Assumption Cathedral and a museum. You will also have the opportunity to visit a children’s school in Kuzino or the local Merchant House. Return on board for an afternoon departure. CArrive midafternoon in Yaroslavl, one of the Golden Ring cities that preserves the memory of Russia’s historical events. Tour this ancient town rich in monuments and visit the covered food market, where you may shop for handcrafted souvenirs. During your free time, you may visit the Church of St. Elijah the Prophet, featuring detailed frescoes and icons. Return to your ship for dinner and an evening departure. After breakfast, disembark for a walking tour through the provincial village of Uglich, another Golden Ring city. See the former Kremlin of Uglich and visit the Church of St. Dmitry on the Blood, built on the site where Ivan the Terrible’s son Dmitry was mysteriously killed. Then a local family invites you into their home for tea and friendly conversation. Lunch is served on board the ship; cruise through the night. This morning, cruise along the Moscow Canal, approaching Moscow during lunch. Disembark for a half-day city tour. See the famed Bolshoi Theater and stop at Red Square for a view of the brightly colored St. Basil’s Cathedral. You also get the chance to explore the famous GUM Department Store and experience the city’s Metro. Enjoy an evening performance of traditional Russian folkloric music followed by a late onboard dinner. Today you have a full day to further explore Moscow’s many buildings, parks and monuments. This morning, you may want to join a half-day optional excursion to Tretyakov Gallery, the world’s foremost museum of Russian fine art. Lunch is served on board the ship. This afternoon you may choose to take an optional Jewish Moscow tour, visiting key sites within Moscow that illustrate the history and spirit of the Jewish people who settled there. Or you may also choose to visit the Cosmonaut Museum to see displays about the history of space exploration. Dine on board, then relax, or take an optional Moscow by Night tour. After breakfast, travel to the city’s famous red brick enclosure known as the Kremlin. Go behind its walls to see historic gems like Tsar’s Cannon and Tsar’s Bell, and tour inside two cathedrals. The afternoon is free to relax and explore. Perhaps join an optional tour of Moscow’s oldest museum, the Kremlin Armory, which originated as the royal arsenal in 1508. Or, you may wish to spend some time people watching in Red Square or visit Lenin’s Tomb. On Saturday or Sunday you may also choose to visit the Cosmonaut Museum to see displays about the history of space exploration. Return to your ship for a farewell dinner. Scott Webster is Chef-Owner of Carrington Place Bar, Restaurant and Guest House in Newcastle, New South Wales and Osia Steak & Seafood Grill at Resorts World™ Sentosa’s Festive Walk, Singapore. Epitomising the face of eclectic Australian cuisine is celebrity chef and successful entrepreneur, Scott Webster. Scott’s consultancy company, Australian Culinary Consultants (ACC), over the years, has planned and developed dining concepts for some of the world’s major hospitality projects including Hyde Park Corner in London for the InterContinental group and the Westin Hotel in Sydney on the former GPO site. Through hotel and airline food promotions, assisted menu planning, trade exhibitions, seminars and lectures abroad, as well as through educational tours throughout Australia for executive chefs and importers, ACC has assisted in placing Australia at the forefront of many a chef’s preferred supplier list. Chef Webster owns and operates the highly acclaimed Carrington Place Guest House in Newcastle, Australia, which he opened in April 2009 with his wife, Jennifer. The guest house has beautifully restored guest rooms, a tapas bar, dining room and 2 private rooms that serve contemporary local cuisine highlighting superb regional products enhanced with indigenous flavours from Australia. A featured wine list with a focus on wines from the renowned Hunter Valley. Chef Webster is also one of several celebrity chefs who owns and operates a highly acclaimed restaurant within Resorts World’s Sentosa Singapore, Osia Steak and Seafood Grill, awarded its first Michellin star in 2016. As a chef, Scott has an impressive career track, after completing his formal training at Royal Sydney Golf Club he worked throughout Europe, the USA, Canada and Asia and had the privilege of working at the legendary Savoy Hotel in London, UK, as well as the Grand Hotel in Leysin, Switzerland. In 1988, he was appointed the co-ordinating chef for the athletes’ village at the Winter Olympic Games in Alberta, Canada. Chef Webster also has a very successful food export business, Prestige Foods International, based in Melbourne, suppling Australian ingredients to chefs and kitchens all over the world. Together with Jennifer, the couple launched The Trevor Drayton Scholarship in 2009, to honour the memory of the late wine maker Trevor Drayton, creating career opportunities for promising young chefs / service staff and wine makers from around the region. Today, Chef Webster continues to change the landscape of the Australian culinary scene. Conditions: Hunter Travel Group Pty trading as Signature Journeys puts together holiday packages but is not itself a transport, event or accommodation provider. It acts only as an agent for those principal service providers. Deposits and final payments: $2,000pp deposit is payable at the time of your reservation & Final payment not later than 4 months prior to departure date (1st May 2019). A deposit holds services requested but does not guarantee prices. Cancellations: If you cancel or terminate your holiday there will be no refund of your deposit or any other amount paid prior to cancellation. After final payment, there will be no refund of any additional supplier deposit paid and there may be cancellation fees charged by airlines, hotels and ground/cruise operators amounting to all or part of the cost paid. Travel Insurance: At the time of booking you should consider purchasing a travel insurance policy of your choice to cover loss, damage, illness, injury or other unexpected circumstances. We are agents for Suresave Travel Insurance. Responsibilities: Signature Journeys is responsible only for the services it provides and its accepts no responsibility for any loss or injury to persons or property caused by any act or omission, whether negligent or otherwise, on the part of any principal providing any services to any person taking advantage thereof, including but not limited to any loss or damage in respect of luggage or other property or inconvenience or for any dissatisfaction with the properties or services provided by the principals. To the extent permitted by law, Signature Journeys is not liable in contract or tort for any injury, damage, loss, delay, additional expense or inconvenience caused directly or indirectly by force majeure or other events which are beyond the control of Great Events or are not preventable including, without limitation, the acts or omissions of any person taking advantage of the services provided by Signature Journeys or anything else that interferes with, alters or adds to the cost of the services requested or booked. The making of a booking constitutes acceptance of the services described in this brochure and that the terms and conditions contained in this brochure and on the Signature Journeys website constitutes the entire agreement between them. For a full copy of the booking conditions for Signature Journeys please contact us. Hunter Travel Group Pty Ltd ABN 86 089 025 696. A11468. All prices listed above include economy class Fly Free ex Sydney and are per person twin share. Solo price available upon request. Airline at Viking Cruises discretion. Tour is based on minimum 20 Passengers. See below for full terms & conditions.